Maria Quinlivan has won a prestigious award from Australia’s peak physiotherapy association. 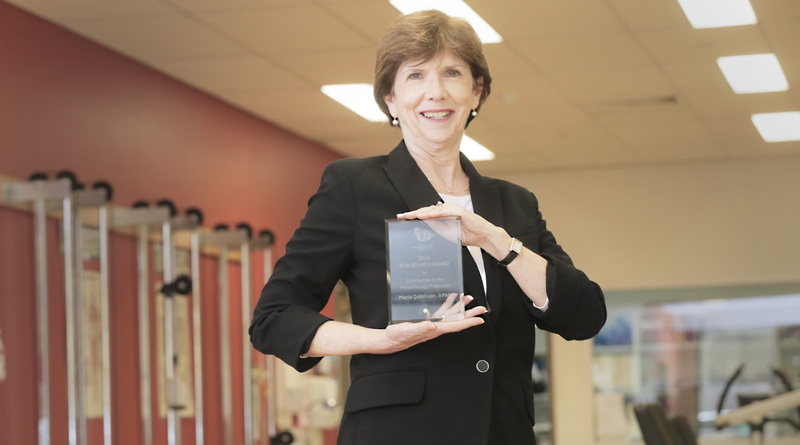 Westmead Hospital’s head of physiotherapy Maria Quinlivan has been recognised with a top honour from the Australian Physiotherapy Association (APA). Maria was recognised at an awards function introduced by the APA to recognise outstanding contributions to physiotherapy in Australia. Maria was recognised as part of this year’s awards ceremony for her contribution to the profession. Maria has been a leader in the physiotherapy public health sector since the 1980s. She is a champion of junior and graduate physiotherapists, continually building the hospital’s graduate program. She is always striving to improve the physiotherapy service through innovation and research, and is always encouraging her staff to become involved in transnational research. Maria said she felt privileged to receive the award from the Australian Physiotherapy Association. “As a physiotherapist who has worked my whole career in the NSW public hospital system, I feel honoured to have received this award,” Maria said. “Working in the hospital setting provides opportunities to identify and facilitate advancements in research, clinical practice and clinical teaching across the traditional three core areas of physiotherapy – musculoskeletal, cardiopulmonary and neurology – as well as specialty areas such as hands and women’s health.